Tamsin and Adam went to secondary school (or high school for our American readers) together, Adam was a year below Tamsin, but they did not properly meet until 2015, when they started working together at their local pharmacy. Tamsin sold health and beauty products and Adam did deliveries for the home care department. They chatted at work, but it was Adam's mother, who also worked with them, who saw their potential and made them swap numbers. Tamsin took the initiative and asked Adam out for their first date. In a classic first date fashion, they went for a few drinks and then to a really bad movie. As Adam walked Tamsin home, they had their first kiss in a little park, overlooking the church where they later married and they have been inseparable ever since. You can find the couple on Instagram @tamsinjacklin and @adamjacklin. They had been dating for 10 months, when Adam felt ready to propose. It was Tamsin's 26th birthday and they decided to celebrate by "glamping" at a nearby village in a yurt. They were hanging out at the campsite, playing cards, when Adam announced that if Tamsin won the next round, she could have her birthday present. Naturally, Tamsin trounced him and Adam slyly brought out a little jewelry box and dropped to one knee. "What are you doing?! What's in that box?!" Tamsin exclaimed. To which Adam replied, "What do you think is in the box?" The couple married on September 2nd, 2017 at St James' Church in Louth, Lincolnshire, UK. The reception was held in a marquee at Louth Golf Club also in Lincolnshire, UK. They decided not to set a definitive budget because they knew what they wanted and they were willing to pay whatever it costed. However, to allow for our more expensive elements like the band and the marquee they saved money by DIY-ing their invitations and table decorations. All in all, they spent approximately £12,000 or $15,000 on their 150 guests. They chose St James' Church because they both attended services there while they were in school. It is a beautiful building, which can be seen from miles away and the floor-to-ceiling stained glass windows and massive aisle added a major "wow" factor to the visuals of their ceremony. 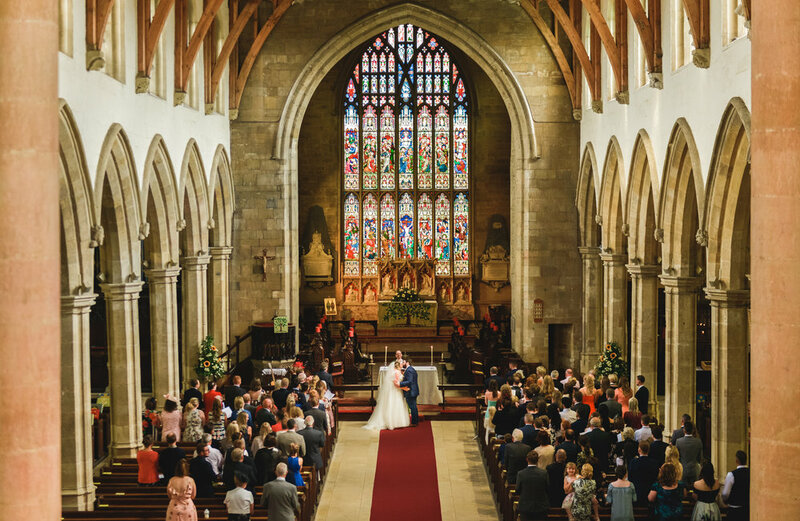 "The stained glass windows at the end of the aisle are just mesmerizing," said Tamsin. For the reception, they wanted something a little more low-key and they did definitely did not want a formal, three-course meal so a marquee was a perfect solution. Louth Golf Club is walking distance from the church and Tamsin's parents are avid golfers so they were familiar with the venue and the people who worked there. 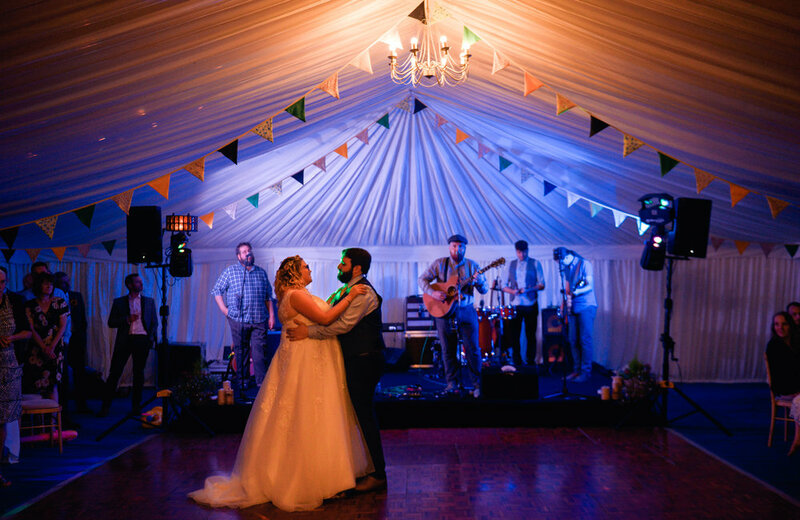 "We wanted the wedding to feel like a summer BBQ but with everyone wearing nice suits and dresses," explained Tamsin. There was no color scheme, just lots of wild flowers and sunflowers, which are Tamsin's favorite. They had lawn games outside - croquet, swing ball, giant jenga, limbo, even a bucket and spade in a bunker on the practice green. A friend of the couple spent hours making the bunting, which they hung inside the marquee. For signage, they painted wooden pallets and they had an authentic vintage suitcase for their card box. Family is important to both Tamsin and Adam so they incorporated them by showcasing the wedding photos of their parents and grandparents. The couple decided that they wanted to have a band early on to add something extra special to their day. "We hired a band called The Nameless Three," and they were amazing," gushed Tamsin. "They have a country/folk style, but play all sorts of songs, meaning everyone got up and on the dance floor. The fellas were really fun and charismatic, interacting with the crowd and enjoying themselves. All our guests have commented how much they enjoyed the band, I recommend them everywhere I go!" So that guests could "play along," they made sure to have lots of inflatable instruments on hand. Another element that the couple added to wow their guests was to organize 'The Great Wedding Bake Off,' a play on the popular reality TV show. Inside their invitations, the couple added a card inviting their guests to participate by bringing a baked good to the wedding. "It was so successful, there was every type of cake, we couldn't have anticipated how well it worked in the end," said Tamsin. "We even ordered a life-size cardboard cut out of Paul Hollywood to stand next to the table to 'judge' them." Tamsin's only complaint is that she and Adam were too busy socializing and dancing that they did not get as much cake as they would have liked. Their formal wedding cake was made by another close friend. "This wedding was a case of who you know not what you know as so many people were involved helping us in one way or another," said Tamsin. "Very family and friend focused." "Personally, I don't know much about flowers," admitted Tamsin. "So when I went to see my florist, Flower's by Kay, I was absolutely useless. But she was so amazing and asked such good questions that she knew what I wanted without me even knowing. All I said to her was 'sunflowers and wild flowers?' I wanted them to look like I had just scooped them up from the ground, nothing too tidy." The gorgeous, bohemian floral design added to the relaxed beauty of the day. Tamsin ordered her flower crown and a hair piece for her bridesmaid from the Artisan Dried Flower Co., and the floral artist incorporated the same colors into her bouquet. "It also matched my glasses, unintentionally," said Tamsin. Tamsin plans to wear her flower crown on their first wedding anniversary. Tamsin loved the whole day, but one of the most memorable and funniest parts was the getting ready process. "I had had my hair done and make up was finished but it was too early to go put the dress on," said Tamsin. "So we were just sat around eating ham sandwiches and crisps waiting eagerly." Adam's favorite part watching Tamsin walk up the aisle to him. "It was an emotional moment as I had cried every step of the way up the aisle to him," said Tamsin. "He told me I looked beautiful, I said he looked handsome and then we got married! Good thing we had a hymn to sing straight away or else I would never have been able to pull myself together for the vows." One of the biggest challenges for Tamsin and Adam while planning was time management. Tamsin had just started her nursing degree and it was difficult to juggle assignments while dealing with all of the little details that go into wedding prep. Tamsin's advice to other members of the Big Bride Club is to "Just. Keep. Calm." Tamsin loved her day and was happy with her dress and she looked beautiful, but she was disappointed in dress options overall. "Being a plus size bride means you just walk into a wedding dress shop and try on all the wedding dresses as more often than not, they only have that dress in a sample size and it will be five times smaller than you are," said Tamsin. "Browsing the internet does not really help that much sometimes either as the plus size models are all beautiful size 14/16 girls." Tamsin is a comfortable size 20/22 and she could not imagine herself in any of those dresses due to the lack of representation. Tamsin wants other plus size brides to feel worthy of any dress that they want to try and look to the internet and real life bridal stories for inspiration. "Embrace yourself and your beauty and do not just settle for what fits," said Tamsin. "And do not succumb to any pre-wedding diets just because you feel you should. There is no shame in staying as you are for your wedding day. If you are happy, then go for it. Your partner loves you regardless." 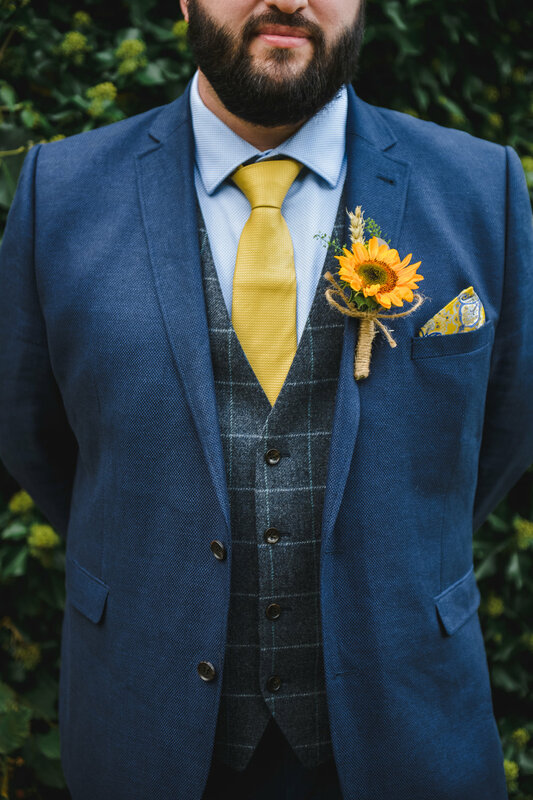 Groom's Jacket & Waistcoat: Moss Bros.